Apple Cider Vinegar Remedy;Heart Disease. Take one cup as a measurement and always use it for the purpose. Now you have four cups of ingredients. Put all in a pan and simmer all ingredients down to about one cup. During boiling process the color of concoction may change, but not to worry. Now let the concoction cool till normal room temperature. Now add one cup pure honey and stirr well and keep in a air tight bottle. Now take two tablespoons full in the morning with empty stomach and nothing else and see the magic. Within 15 days to one month you will notice a remarkable change. Please send your feedback at adambarai1[at]gmail[dot]com. Boil (simmer) until 3 cups volume is left, add 3 cups of natural honey, stir until mixed. Boil (simmer) until 3 cups volume is left, add 3 cups of natural honey, stir until mixed. Once cool take one Table spoon before breakfast and one table spoon after dinner. This is an excellent home remedy that you want to keep available at all times in your home. It’s great as a preventative and for maintaining good health. There are some variations to this with the addition of other ingredients such as ginger, or cayenne pepper. 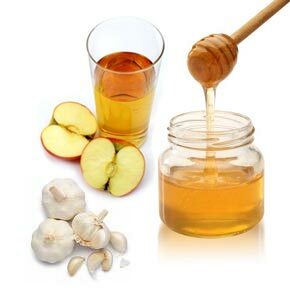 The base mixture includes the three main ingredients of garlic, apple cider vinegar and honey. Each of these three ingredients have individual benefits on their own and in this mixture, a synergistic effect enhances the properties of each. The apple cider vinegar must be unfiltered and the honey must be raw, unpasteurised (and preferably organic) honey for all the benefits to be realised. 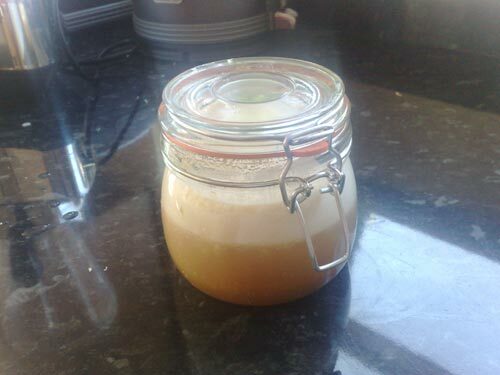 One of the main reasons honey is pasteurised is to speed up the packaging process (heating makes it flow much quicker) – so pretty much all honeys from supermarkets will be unsuitable. This remedy is an immune stimulant, it lowers blood pressure as well as cholesterol (if you are someone who still believes in that hypothesis), it leads to fewer colds and infections, and is helpful in conditions such as gout, arthritis, and joint aches. It is also a good tonic for the digestive tract and benefits the skin, and is helpful in weight loss. In short, it is beneficial for a wide range of conditions as it is a general immune stimulant and enhancer. 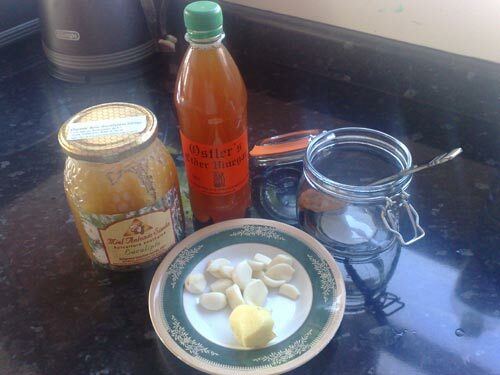 You can read the numerous articles on garlic, honey and vinegar elsewhere on this site. Mix all the ingredients into a blender and mix at high speed for 45-60 seconds. Alternatively, you can put the garlic in first, blend well so it becomes fine – or you can use a garlic crusher instead – and then place in the blender, then mix in the honey and apple cider vinegar and blend for another 10-15 seconds seconds. Then pour into a glass jar or container (sealable) and leave in the refrigerator for five days, with the occasional stir every day. After five days the mixture is ready. There are other things that can be included. You can added a small amount of ginger (one or two inch length), you just put it in the blender with the garlic, and some cayenne pepper (one small to medium sized pepper) can also be added. The normal dosage is 2 tsp in a glass of water, daily, first thing in the morning. The mixture is very strong, and should not be taken directly.